Confident and elegant, the Charmer employs his wits and wiles with more precision than a laser scalpel. He knows how to talk the talk, possessing natural charisma that makes him irresistible. 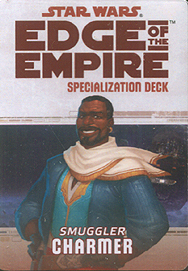 This deck requires the Edge of the Empire Core Rulebook and Fly Casual. It includes cards for all 20 talents available in the Charmer specialization.